As part of the Rotary Club of East Coast Bays’ business plan, the club set an objective to encourage a style of membership that is open, communicative and with strong fellowship and Rotary family involvement. With guidance and great leadership from our District 9910 Governor Peter Garnett who is a member of our club, the club President Caroline Campbell has developed a culture that encourages and values the input of all club members and supports and enables new ideas. One of our new and younger members suggested in his three minute talk, that the club look at some different and more innovative ways we could raise funds for our various projects. The “Give a Little” website was one vehicle he suggested we should explore. The Give a Little concept is already a well-established system for giving, but it had not been used as a platform by our club before. Once we had the green light from the Board of Directors, there were several steps in the process we had to undertake to ensure our page was set up properly as a registered charity, but once completed, we were good to go. Before long we had our first fundraising project and the “Wheels for Max” campaign began. Max, a 12 year-old with a form of cerebral palsy that affects all four of his limbs, had his heart set on a 4x4 all-terrain wheelchair, known as “the beast” that would enable him to enjoy a more active and participative life. 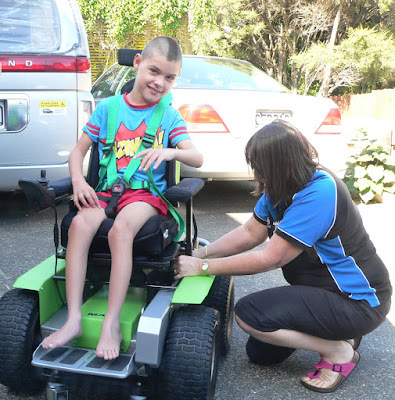 With our club’s own push via social media and the help of the local newspaper, the Give a Little campaign was very successful and more importantly, over just five weeks, proved a fast and efficient way to raise the $15,000 that was needed for this life-changing piece equipment for Max. This project highlighted what is great about of the Rotary Club of East Coast Bays. A collaboration between some of our newest members with their fresh perspective and ideas, in partnership with longer term members who knew how to best leverage the funds we had raised by applying for a Matching Grant. Combine this with the support and encouragement for this new thinking from everyone else in the club and the outcome was a fantastic result which culminated in the donation of the “The Beast” to Max on February 23 on Rotary’s 111th birthday.